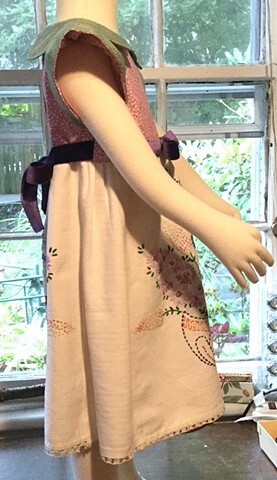 Exquisite hand-embroidered dishtowel gets reassigned as the skirt for a size K-1st Grade (age 5-6) dress with tiny calico prints to enhance it on the bodice. Measuring 22” across chest and 23” shoulder to hem, it features petal-shaped collar and flutter sleeves in a green print of tiny leaves (you’ve got to look closely!) and bodice of similar print in pink. 4 purple buttons close it in the back with a skirt placket, topped off with a purple ribbon sash, including a bow in the front, all 100% cotton, $100, made by the designer herself and shipped free to any address in the U.S.